Whether you want to educate your customers with an ebook download, to generate that classic online sale, or give your sales team some fresh leads, defining your paid search goals is a critical step towards success. When you think of a goal, what comes to mind? 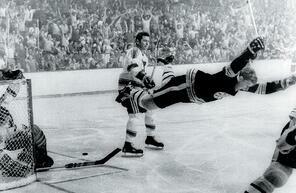 Bobby Orr's fourth goal to beat the Blues and win the Stanley Cup? Cristiano Ronaldo completing one of his signature soccer moves? (sorry, I don’t follow futbol) How about for your business; are you looking to sell more widgets than last year using AdWords? Do you want to generate leads at a low cost per click? When you figure out what you want to accomplish, you’ve found your goal! Sting might have taken the concept of tracking a little far. There are a variety of tracking means that allow us to not only track traditional goals like contact forms and sales, but also phone calls or even tracking popular sections of your landing page with heat mapping. Third party tracking platforms today are scalable and customizable, so there are solutions for agencies as well as in-house account managers. Tracking a goal has never been easier or more thorough. We have traditional tracking by integrating AdWords with Google Analytics, where we can track goals like form submissions or ecommerce transactions. 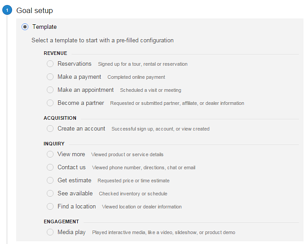 Google Analytics becomes more robust every day, now offering templates for goal tracking ranging from inquiries to estimates. If you have a CRM system like Hubspot, they are already built to help you track your customers and leads. Setting a goal is one thing, but success lies in what you do to achieve this goal. You have your goal, you selected and verified your tracking method; what’s next? If you’re already running a successful business, then you’re probably doing it. If success isn’t the case, then it’s time to reevaluate your day-to-day actions. Every action you take should be a step closer to your goal. This will range from smaller actions like equipping your sales team with the knowledge to close a deal, to larger actions like ensuring your website is optimized to handle an emerging mobile user base. By using clear and measurable goals, success is all but assured.